Take reports about a new WPK document slamming Beijing with a dose of salt — but frustrations are very real. North Korea’s ruling party recently called on citizens to stand up to its patron China’s “hostile schemes” in a blistering attack that invoked nuclear war with Beijing, a report has claimed. In a document distributed to provincial committees, the Workers’ Party of Korea implored party members and workers to “soundly crush China’s pressuring schemes with the force of a nuclear storm for its betrayal of socialism,” reported The Daily NK. The document, dated March 10, lambastes China’s decision to join sweeping U.N. sanctions against Pyongyang over its latest nuclear and rocket tests. Daily NK, a North Korea-focused news site, said it obtained the document via Sino-North Korea relations expert Lee Young Hwa, a professor at Kansai University in Osaka, Japan. North Korea analysts that spoke to The Diplomat, however, expressed skepticism about the document’s authenticity. Another North Korea scholar, who did not want to be named but said he was familiar with the document’s acquisition, also questioned its authenticity, pointing to it being handwritten and how it reached the media. Lee, the reported source of the document, could not be reached for comment. 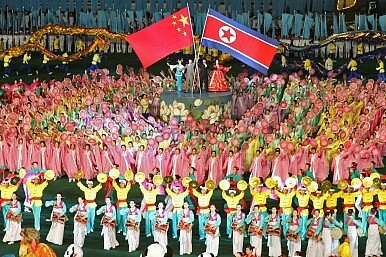 Even if fake, however, the document echoes real North Korean frustration with China, said Daniel Pinkston, an international relations professor at Troy University. Pinkston said the countries had shared antipathy for years, despite their reputation as close allies. China is responsible for more than 70 percent of North Korea’s trade, which, analysts believe, gives it significant influence on its neighbor’s behavior. While Beijing voted for the most recent U.N. sanctions last month, it’s unclear how serious it is about applying them. Early reports have suggested that lax enforcement has allowed trade to continue largely unaffected at major border crossings such as Dandong. December 2017 Sanctions on North Korea: Business as Usual? New sanctions are unlikely to significantly change the status quo on the Korean Peninsula.